Videos can be informative. They are also used to promote dangerous ideologies. The Flat earthers use video almost exclusively and have many followers. The Catholic Church is dead because the gates of Hell have prevailed against them. They live in greed, darkness, hatred, sexual deviancy, etc. (I could go on all day). Your video fails. A few nut cases making a video does not constitute truth in any form. And. . . more importantly it has absolutely nothing to do with the King James Bible. This entire thread is simply a diversion. 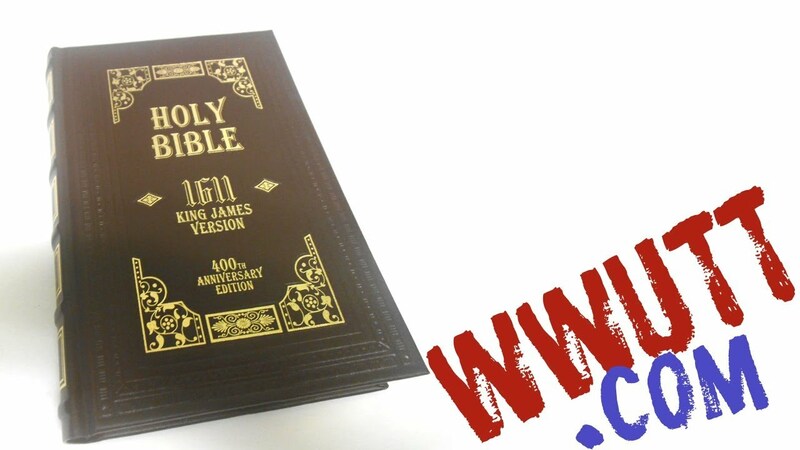 This poster will not define and explain his meaning for the term "the Holy Bible," but his title for this thread affirms that he uses it only for the 1611 KJV. Is use of an undefined term like using a code word for those who also accept the same modern, non-scriptural teaching concerning the KJV? If the pre-1611 English Bibles of which the KJV is a revision were not also Holy Bibles, the 1611 KJV based on them could not be a Holy Bible since qualities not found in the pre-1611 English Bibles could not be transferred to a revision of them. Is the 1582 Roman Catholic Rheims New Testament considered a Holy Bible since the Church of England makers of the KJV borrowed many renderings from it? A jaegar is the name of a genus of predatory or rapacious seabirds which purse and force weaker birds to leave or give up their prey so they can take it. A jaegar is also a German name for a hunter. The general name "the Holy Bible" does not identify to what English Bible you refer. From reading your posts and your title of this thread, it is likely that you try to use this general name solely and exclusively for the 1611 KJV. Thus, the 1611 KJV was not the first to have this title or name the Holy Bible. The 1611 KJV merely kept this name from the title page of the Bishops' Bible, even though the Church of England makers of the KJV made hundreds and thousands of changes to the text of the Bishops' Bible. The Holy Bible [English translation] in the Bishops' Bible is not the same as the Holy Bible[English translation] in the 1611 KJV even though both had the same name. Would you like to try to have a meaningful conversation? You seem to have a vast knowledge of Bible History, but can you have true knowledge of Bible History without first having Biblical knowledge of Bible Prophecy concerning The Holy Bible? Have you truly weighed out the passages of Matthew 24, 2Peter 2-3; 2Timothy 3; 2John 1:7 Jude; 1John 2:18-19, 2John 1:7, 3John & Amos 8? Do you understand each of these passages? Have you considered to check if the men involved, for example, that were President of the first Baptist Semenary were faithful Believers or Deceivers to determine that what had been taught to be factual truth or error? I was not impressed with that video. The regurgitated mantra of man made bloviating opinions in that video was neither convincing, nor informative. You could be generally describing videos that advocate a modern, non-scriptural KJV-only view. I consistently attempt to engage in meaningful discussion, presenting as accurate and as sound information as possible. So far you have declined engaging in meaningful conversation or dialogue. I have clearly advocating applying scriptural truths consistently and justly. I repeatedly advocate the applying of the exact same measures/standards of doctrinal soundness to all Bible text critics/editors and to all Bible translators. Typically it has been advocates a KJV-only view that refuse to apply the exact same measures/standards consistently and justly. And why should we believe that you have properly interpreted those passages? I am making a sincere attempt at communication. Would you like to demonstrate meaningful conversation, by engaging the questions that I asked you, and answering them? It is not demonstrating sincere, meaningful conversion to demand that I answer your questions while you have repeatedly dodged and avoided questions I have asked you. I have considered all that the Scriptures state and teach about themselves, and you have not proven that I reject any actual scriptural truths to give any basis for your attempted attack on my beliefs. You seem to assume incorrectly that I have to agree with your opinions to believe the Scriptures. My sound faith in God and in the Scriptures does not stand in the wisdom of men [in human, non-scriptural KJV-only reasoning/wisdom] (1 Corinthians 2:5). I have presented my scripturally-based position, and you have not engaged in meaningful discussion concerning it. I have backed up and discussed what I assert. On the other hand, you have not presented any positive, clear, consistent, sound, true, scriptural case for your claims concerning the KJV. You do not back up what you claim when it has been soundly challenged or answered. You merely try to dismiss and dodge my sound advocating of a consistent, just application of scriptural truths. You seek to dictate and limit what is discussed instead of backing up your own claims or discussing what I have presented. That is not making a sincere attempt at communication. You seem to seek to question in order to find a way to accuse and attack in an one-sided manner rather than engage in fair discussion. I do not prevent you from engaging in serious meaningful discussion. You may choose to avoid it on your own. Last edited by logos1560; 02-03-19, 02:59 PM. It is not demonstrating sincere, meaningful conversion to demand that I answer your questions while you have repeatedly dodged and avoided questions I have asked you. I have considered all that the Scriptures state and teach about themselves, and you have not proven that I reject any actual scriptural truths to give any basis for your attempted attack on my beliefs. You seem to assume incorrectly that I have to agree with your opinions to believe the Scriptures. I have presented my scripturally-based position, and you have not engaged in meaningful discussion concerning it. I have backed up and discussed what I assert. On the other hand, you have not presented any positive, clear, consistent, sound, true, scriptural case for your claims concerning the KJV. You do not back up what you claim when it has been soundly challenged or answered. You merely try to dismiss and dodge my sound advocating of a consistent, just application of scriptural truths. You seek to dictate and limit what is discussed instead of backing up your own claims or discussing what I have presented. That is not making a sincere attempt at communication. It appears to me, as it has always been the case, that you choose to avoid answering questions directly related to Bible passages. Why is that? Also, I assert that you choose to control the dialog, making it "one sided" with your pre-made; pre-arranged mantra. To me, this is no different than if a Seventh Day Adventist, Mormon, or Jehovah's Witness shoved one of their publications in my face, and said, "You must read this pre-made, pre-arranged material and answer the pre-made questions in relation to the pre-made and pre-arranged indoctrination for a pre-dermined outcome. You must accept our indoctrination. Resistance is futile. You will be assimulated into the Borg Collective." I authored this thread with the attempt of taking another approach, to ask questions, discuss Biblical Doctrine, and so forth. I know that there are a great amount of false teachers on CARM. We are told that before we register or sign in. I am more than willing to discuss my faith and what I believe concerning Jesus Christ and what is written in The Holy Bible. But in all of this past year, not one time have I ever seen that you are willing to engage in such a discussion. I have observed that you are more than willing to point out what others believe about one subject or another, but never at anytime, have I observed you discussing what you believe. I don't know if you are even a Christian. I don't know if you believe in Jesus Christ. I had asked you questions before about what you believe, but you chose not to answer them, and to ignore them. At any given moment, I could have a knock at my door from a Jehovah's Witness. They will be quick to tell me that my Bible is wrong, and that their New World Translation is the only "Translation" that is correct, along with telling me that everything that I believe is wrong, and that they are the only one's that are not. I can go on all day with many other examples. Now, like them, you want to convince me that my Bible is wrong. I know all of the things that the JWs, Mormons, and S.D.A. believe, even better than they do. But you, on the other hand, have resisted to give any profession of your faith or if you even have a faith. Why is that? What is your motive and intent, if it is not to deceive me? While I don't know what you believe, I do recognize that you have the very same motive and agenda, as the Jehovah's Witnesses, to tell me that my Bible is wrong. I have also observed that you tout most similar arguments as the Jehovah's Witnesses with the effort to prove that my Bible is wrong. It appears to me, as it has always been the case, that you choose to avoid answering questions directly related to Bible passages. Why is that? You fail to prove your allegations to be true. I have answered a good number of questions. I wisely choose not to answer invalid questions that assume as true unproven KJV-only premises and diversionary questions that try to change the subject of this forum. You do not practice what you preach since you have not answered questions asked you. No one prevents you from discussing actual Biblical doctrine that relates to the subject of Bible translations or the subject of KJV-only. You sometimes incorrectly try to bring other doctrinal matters into this forum concerning KJV-only. Because you start a thread, it would not entitle you to try to change the subject of this forum and it would not entitle you to violate forum rules. Do you try to hide your human, non-scriptural KJV-only reasoning behind questions? In order to discuss, you need also to answer questions in order to expect your questions to be deserve consideration. In a number of cases, questions should not be answered. If you ask invalid questions that assume unproven KJV-only premises, they should not be answered. If you ask diversionary questions to change the subject or bring in other doctrinal matters, they should not be answered. If you ask questions that attempt to misrepresent and distort what another poster stated, that question also would not deserve to be answered. While I don't know what you believe, I do recognize that you have the very same motive and agenda, as the Jehovah's Witnesses, to tell me that my Bible is wrong. I have also observed that you tout most similar arguments as the Jehovah's Witnesses with the effort to prove that my Bible is wrong. Your allegations and misrepresentations are wrong and false. I do not have the same motives and agenda as Jehovah's Witnesses and do not use the same arguments as Jehovah's Witnesses as you incorrectly allege. Your bogus, derogatory, false, insulting accusations would bear false witness in disobedience to the Scriptures. Your improper, insulting misrepresentations and allegations refute your claim that you were attempting to engage in meaningful conversation. Disagreeing and questioning your human, non-scriptural KJV-only reasoning/teaching is not saying that the KJV is not the word of God translated into English in the same sense as the pre-1611 English Bibles and as post-1611 English Bibles such as the NKJV. I read and accept the KJV as what it actually is. I state the truth concerning the KJV. I accept the proper, derived authority of English Bible translations. If you do not know what I believe, it is because you do not read carefully my posts. You have be blinded and hindered by your own human, non-scriptural KJV-only reasoning as you incorrectly assume false things about believers who disagree with following the opinions of men. I believe God and the Scriptures. Sound, biblical faith in God and in the Scriptures does not actually stand in the wisdom of men [in human, non-scriptural KJV-only reasoning/teaching]. I have made it very clear that I believe what the Scriptures teach and that I am a Bible-believing Baptist. Last edited by logos1560; 02-03-19, 03:44 PM. I take the instruction of The Lord Jesus Christ and His chosen Apostles most seriously. Readers of this forum may think that your posts demonstrate otherwise. Your own posts provide evidence that would demonstrate that you do not apply some clear scriptural truths consistently and justly. Perhaps my posts indicate that I take it more seriously and justly than your posts do. I believe and adhere to what is written in the Scriptures. What is actually written in the Holy Bible and the instructions of the Lord Jesus Christ and His chose apostles do not include your modern, human, non-scriptural, KJV-only opinions. You have not demonstrated that your modern, KJV-only teaching is written in the Holy Bible. I am making a sincere attempt at communication. Readers of this forum may disagree, considering your unproven allegations. Last edited by logos1560; 02-03-19, 04:08 PM. Readers of this forum may think that your posts demonstrate otherwise. Your own posts provide evidence that would demonstrate that you do not apply some clear scriptural truths consistently and justly. Perhaps my posts indicate that I take it more seriously and justly than your posts do. The Leaders of the Watchtower Society (Jehovah's Witnesses); Church of Jesus Christ of Latter Day Saints (Mormon) now called "The Church"; and Seventh Day Adventists would make similar remarks to erroneously influence "Readers". That is the Occult Mentality. My hope is that people will be discerning and TRUST what is written in The Holy Bible, and not drink the Kool-Aid of False Prophets & False Teachers. It is amazing that a professed believer would incorrectly allege that accepting what is written in the Scriptures is supposedly evidence of "occult mentality".